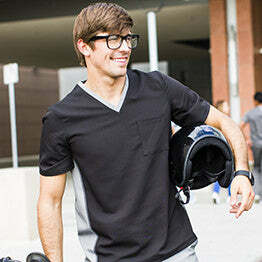 Body Intelligence is a women’s and men’s clothing line specifically made for the modern medical industry. Crafted from durable, top quality fabrics our clothing excels in flexibility and functionality. Made to move with you through long shifts, our scrubs retain their shape, have long lasting antimicrobial protection and keep a wrinkle free appearance. Body Intelligence is exceptionally tailored to fit bodies of all types - small to large, allowing you to look and feel your best. Founded by Stephanie Garrigus, Body Intelligence focuses on the principle that scrubs can be much better and stylish than they are today. Her core mission is to address the healthcare marketplace’s need for intelligently designed scrubs for the active, health conscious medical professional. We are passionate about clothing that that fits comfortably, flatters and gives a professionally polished look. All of these are key brand features that make Body Intelligence clothing different – our comfortable designs elevate the medical professionals appearance to the level of professional they are. Why we’re a different scrub, learn more.